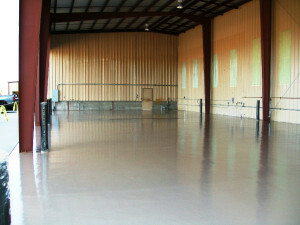 Do Concrete Floors Need Protection? In a word: Yes! Concrete is formed by a combination of cement, water, and construction aggregate. When hardened, it is one of the few materials strong enough to withstand heavy traffic, chemicals, or abrasion. This makes concrete perfect for floors in warehouse facilities and manufacturing and food processing plants. From the Roman Pantheon to Hoover’s Dam, concrete also comprises some of the most famous structures in the world! However, despite supreme durability, concrete slabs do erode and succumb to heavy abuse over long periods of time. When left untreated, the porous materials that comprise concrete weaken severely. This means that many activities performed in industrial and commercial locations—tire traffic or chemical exposure—deteriorate a concrete floor’s ability to endure constant wear and tear. That’s where concrete coatings come into use. Concrete coatings give floors a protective extra layer that extends natural durability. Aside from more protection, they also dress up dreary surfaces, simplify long-term maintenance, and improve skid resistance. Some companies choose not to invest in concrete coatings when flooring is installed in order to save money. However, by investing in concrete coatings upfront, a company avoids higher maintenance expenses in the future. Today’s selection of concrete coatings has never been greater. Manufacturers aim to meet market demands for formulations that cure faster, better resist abrasions, and carry less volatile organic compounds (VOCs). Exposure to VOCs damages the central nervous system, with some being linked to causing human cancer. Current concrete coatings also adhere extremely well to properly-prepared surfaces and are available with decorative options. Consumers have hundreds of formulations from which to choose. Shopping around for the right coating can be as daunting as navigating an enormous supermarket. At Arrowhead Deck and Concrete LLC, we understand too many choices can be overwhelming. All concrete coatings vary with regard to performance, ease of application, and final appearance. Therefore, we narrowed your selection from hundreds of possibilities to three of the best concrete coatings on the market. These cost-effective offerings save installation time and provide greater endurance over the long-run. Traditional epoxy coatings are the most popular option for commercial settings. They produce an enduring, high-gloss finish with superior abrasion resistance. Unfortunately, despite their protective benefits, epoxies require 30 days minimum of concrete curing before they can be applied. These concrete coatings also lose adhesion when exposed to excessive moisture and tend to yellow under UV light. To overcome these disadvantages, Arrowhead Deck and Concrete LLC uses advanced epoxies with better permeability and UV stability. Our epoxies also have much faster curing times. Whereas most require twenty-four hours to dry and must cure for several days, our fast-setting coating dries completely within twelve hours. Venetians invented cement-based terrazzo during the sixteenth century. One of the oldest decorative flooring systems, it resulted from embedding tiny pieces of marble or granite in mortar. The floor was then polished until it achieved a high shine. Even hundreds of years later, cement-based terrazzo patterns still appear remarkably beautiful. Newer types of terrazzo, however, have entered the scene and offer many contemporary benefits. Arrowhead Deck and Concrete LLC uses a thin-set epoxy terrazzo that pours on at a density of less than one inch. Present-day terrazzo systems also work wonderfully for multi-colored patterns. Because the epoxy resin can be pigmented, we are capable of achieving an unlimited color spectrum to suit any facility’s design preferences. We can also insert richly colored aggregates such as marble chips, mother-of-pearl, or recycled glass. Polyaspartics are a type of polyurea—a chemical compound that has been commercially available for concrete coatings since the 1980s. The latest evolution of polymer technology, polyaspartics have gained popularity because of their rapid setting time. Some of these flooring systems can be installed in less than twenty-four hours from start to finish. These types of concrete coatings offer greater abrasion and temperature resistance than epoxy because of UV inhibitors, which promotes their overall stability. Arrowhead contractors can apply polyaspartics to full thickness in one coat! Polyaspartics are impermeable, so they don’t transmit water vapor. This means new floors should cure for twenty-eight days minimum before application. Some manufacturers even recommend testing all floors for moisture-vapor. These types of concrete coatings tend to be more expensive than others. However, the extra expense comes with reduced labor costs and downtime. Similar to epoxy terrazzo, most of these concrete coatings are sold as complete decorative floor systems. At Arrowhead Deck and Concrete LLC, we can tint polyaspartics during mixing to suit your preferences. We also have the ability to embellish decorative chips or beads in a broad array of color combinations. In the article you wrote that concrete coating is great because it makes it resistance to abrasion, maintains a beautiful color, and lowers the amount of maintenance. My sister has some concrete around her pool, and she noticed that it was wearing quickly. With a coating, she wouldn’t have to worry about it wearing off, and could even choose a good new color that would compliment her newly planted garden. Super Service Award 6 Years in a Row! Showed up on time and completed work as scheduled.